A wise businessman taught me a lesson about ten years ago. When confronted with a frustrating situation, at a point when several of us on his management team wanted to say, “I told you so,” he said, “I have never made a nickel on an I-told-you-so.” His point was simple: once something irreversible happens, it is a waste of time, energy and resources going down that path; it is better to make those investments up front. The time to address these threats to Lake Minnetonka is now. I suppose it is normal to look away from challenging problems. And make no mistake, addressing the threat of these exotic species invasions is a huge challenge. However, avoidance, rationalization, minimization and fate, which underlie the collective prevention action of legislators and agencies is wrong-minded. However challenging, we must confront these problems. Later this month, in my address to the delegates at the international symposium of the North American Lake Management Society as incoming President, I will cite two large threats facing North America’s lakes – aquatic invasive species and adapting to climate change. Aquatic invasive species, when they get into lakes, alter ecosystems irreversibly and represent one of the greatest threats to our lakes. Climate change, is another large stressor and will accelerate and intensify the impacts of aquatic invasive species. The surveillance and inspections at boat ramps should continue and include an enforcement element. All participants in special events – events that bring boats from faraway places - should abide by the LMCD rules which prohibit boats coming from infested waters. Our community – lakeshore residents, public officials and businesses should demand and expect an effective and sufficiently funded state-wide program. Not implementing these steps now demonstrates an apathy or unwillingness to confront this problem. Additional steps are also needed. The exotic species issue is larger than Lake Minnetonka. It is tempting to fault the MN DNR for inaction; however, I think the real responsibility lies at higher levels. Our state and local public officials must enact clear and decisive policy directions and statutes, and empower natural resource agencies by demanding the enforcement of state laws and adequately funding protection actions. It is unreasonable to expect our agencies to be fully proactive, unless they have broad and clear political support. Lake Minnetonka lakeshore owners and business must also step up to support protection initiatives. In addition to demanding that our leaders and representatives take these threats seriously, we must stop looking to others and start providing significant financial support. 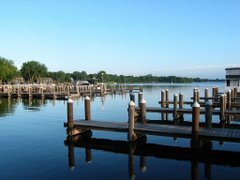 Local efforts have made Lake Minnetonka a model, but much, much more effort is needed to protect our beautiful lake. Now is the time to protect our lake.